A valve's main design characteristics depend on function, but details are determined by manufacturing and user convenience. Construction materials include stainless steel, aluminum, and brass—the choice depending on the required bakeout temperature, pressure range, and the construction material of the remaining system. Every valve has a part that physically moves to open and close it. This part's shape and motion varies greatly with the valve's design and, unfortunately, does not have a generic collective name. For conciseness, the term flapper is used below. Pneumatic actuators are basically pistons that are moved by routing	compressed air into the volume at one end of the piston. When discussing different valve actuators, confusion sometimes arises when the word solenoid is used in association with a pneumatic actuator. Isn't the solenoid (which might also be called electro-magnetic actuator) a different actuation mechanism than pneumatic actuation? Yes, it is, but to control the compressed air causing the valve to shut off, vent, and switch ends requires another level of actuation. The solenoid valve attached to the pneumatic cylinder is entirely dedicated to switching compressed air. In one sense, it may trigger the valve's actuation but isn't really part of the actuator. To distinguish between the solenoid associated with a pneumatic actuator and the true solenoid actuator, the latter is called an electro-magnetic actuator throughout these notes. With the flapper in the closed position, a seal forms between it and the valve body. Depending on the application, pressure range, and maximum operating temperature, several types of seals are used: rubber o-rings, molded rubber rings, rubber diaphragms or cups, soft metal/hard metal seals, hard metal/hard metal seals, and soft metal/polished sapphire flat. are the most common type, often with the o-ring's groove cut into the flapper's surface. Molded rubber rings are vulcanized directly to the flapper without a groove. The rubber may be Buna-N (bakeable to ~80° C) or Viton® (bakeable with the valve open to ~200° C). The latter's chemical resistance and acceptable outgassing/permeation rates make it the elastomer of choice for vacuum applications. With the right construction materials, Viton-sealed valves are often compatible with UHV pressures. or rubber cup seal is trapped around its rim by the valve body. The diaphragm's center is deflected into a saddle or port to block gas flow through the valve. This seal type is used in valves designed for foreline applications where the operating temperatures are not high and pressures vary from rough to high vacuum. seals have a sealing action similar to the CF flange. A metal knife-edge, machined into the body, mechanically deforms a copper pad mounted on the flapper. The valve is closed with a torque wrench and each pad has a relatively short life. However, the pad is replaceable and the valve's life span is not limited by the seal. Such valves enable baking to high temperature (300° C, perhaps 450° C), making them UHV compatible. A version of this mechanism is also found in all metal leak valves. seals are shaped like a large diameter, thin cupped washer (Belleville washer) around the flapper's seal face. As the valve closes, the mechanism causes this washer to flatten (increasing its O.D. and decreasing its I.D.) forcing its inner/outer edges to seal by elastic deformation to the flapper/	body, respectively. The valves are bakeable to 300° C and UHV compatible. seals have a flapper-mounted optically flat sapphire pad mating to a copper gasket surrounding the valve's exit port. The closing force plastically deforms the copper to match the sapphire surface profile exactly. The valve's design prevents rotation of either component so the valve always re-seats in the same place. These valves, which are bakeable to 450° C, are used to control exceptionally low gas flows into UHV chambers. To move the flapper, a rotary or linear motion is transmitted from air-side to vacuum-side through a seal. Both the part that moves the flapper and the mechanism that causes movement are called the actuator. Actuators are driven by manual hand-wheel or levers, electro-magnetic actuators, motors, or pneumatic cylinders. A rotating actuator is often sealed by a dynamic o-ring seal compressed around the shaft. Occasionally, they are used for linear actuators but the greater risk of gas burst makes them less popular than other linear seals. Most dynamic o-ring actuator seals are satisfactory for rough and the (mid) high vacuum pressure range. The most common linear actuators are sealed in metal bellows. The bellows are often welded to the plate in the actuator shaft but are sealed to the valve body by welding, static o-ring seal, or metal gasket seal. Depending on the valve's design, the seals enable operation well into high vacuum or UHV ranges. The rubber diaphragm described earlier is its own seal since the air-side actuator does not penetrate into the vacuum but simply pushes the diaphragm. In a similar way, the corrugated metal diaphragms, sealing extremely fine control leak valves, stretch to enable small travel distances required by the actuator. The conductance of a gate valve can either be determined experimentally or, since the fully open valve's shape is not unlike a tube, calculated using Dushman's table. However, some valves have stated conductance numbers that far exceed those determined from Dushman's table. Unfortunately, the long tube formula applies to long tubes. For example, applying the long tube formula for a gate valve 10 cm thick by 25 cm clear bore gives, in molecular flow, ~19,000 L/s. But applying the Clausing factor (which is <1.0 for all length/diameter ratios <100) to the calculated conductance to allow for the valve's dimensions gives ~4,750 L/sec. Making interpolations to the information given in Dushman's table (which has the Clausing factor built-in) for the same dimension gives ~4,225 L/sec. These various formulas and factors, plus the question "how can a long tube have a greater conductance than a short valve? ", create difficulties for users unfamiliar with some deep vacuum technology concepts. Attempting to compare conductances for gate valves from different manufacturers can cause confusion. However, two points can be made: (a) if two gate valves have identical dimensions for thicknesses and clear bore, their conductances are equal; (b) when making conductance calculations, using the minimum calculated conductance is always the safe policy. The choice of actuator is determined by the power needed to seal the flapper, convenience, automatic control, or remote operation. 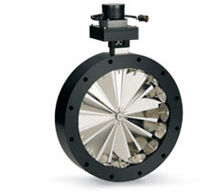 In general, small bore valves that can be easily reached may have manual actuators. 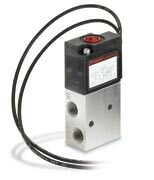 For remote or automatic operation, solenoid or pneumatic actuation is used. Large bore valves with heavy flappers often need pneumatic actuation even if they can be reached. 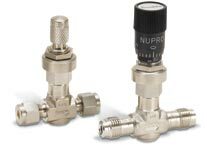 Both small and large valves used as conductance controllers (to give a desired gas flow or pressure control), require the flapper in intermediate, variable positions between fully open/closed. Manual actuation is occasionally used, but most often motor actuation is appropriate. Gate valve applications include isolation between vacuum volume and pump, isolation between chamber and loadlock during sample introduction to the latter, access between chamber and loadlock during sample transfer, and isolation between synchrotron beam lines and experimental stations. The bore's shape is typically circular but narrow rectangles are available for transferring disk-shape substrates such as wafers, CDs, or hard drive disks. Placing a valve between the pump and chamber necessarily reduces the pumping speed from that chamber. To minimize this effect, the valve must have a high gas conductance meaning it must have a large diameter, unobstructed, straight-through bore, and a short distance between flange faces. While not a question of conductance, transferring objects from one chamber to another through a valve also demands a wide unobstructed path, which gate valves supply. The gate valve's plate-like flapper, in its open position, completely retracts from the bore. The flapper's seal is most often an o-ring held in a groove cut into its surface. In well-designed valves, as the valve closes, the flapper remains some distance from the valve body so the opening's edges do not chop the o-ring. As it reaches the end of its linear travel, an over-center mechanism forces the flapper against the valve body, compressing the o-ring to make the seal. While most gate valves will not leak with a 15 psi overpressure on either side of the flapper, typical installations have the o-ring facing the volume where vacuum is retained during pressure cycling or venting. That is, the increased pressure assists in forcing the flapper into its closed position and maintaining the seal. The angle valve's applications include rough pumping shut-off, foreline switching between pumps, cryo-sorption pump shut-off, isolating foreline traps, UHV shut-off, sorption trap isolation, isolating sections baked to high temperature, and more. As the name implies, the valve's ports are at 90° with the flapper's motion along the axis of one port. Although large-diameter angle valves (often called poppet valves) exist, the most popular sizes have ports between 3/4" and 3". Their right angle construction reduces the gas conductance for a given bore-size to somewhat less than the equivalent length straight tube. The flapper is sealed by o-ring, elastomeric disk, or soft metal/hard metal. The last named can be baked to high temperature and are extensively used on UHV systems. Although other actuator seals may exist, by far the most common is the flex metal bellows seal. The bellows' "outer" end is usually welded to a plate attached to the actuator shaft. The "inner" end is sealed to the body by using either an o-ring or knife-edge copper gasket seal similar to the CF flange. 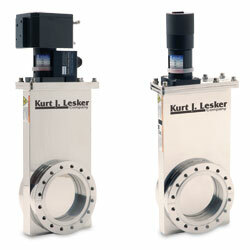 Angle valves are actuated manually, by pneumatic cylinder, or by electro-magnetics. Valves using the last mechanism are sometimes called 'solenoid valves,' but the similarity of name to valves that divert compressed air in pneumatic valve actuation (noted earlier) causes confusion. Here, the 'solenoid' directly actuates the valve's flapper. 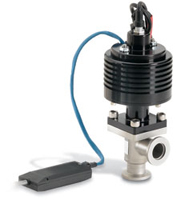 This is a vacuum valve (not a compressed air valve) and is attractive for automating some parts of a system without the need for compressed air. These valves are essentially on-off devices and are rarely used for conductance control (see below)except in the most primitive, manual way. Some advantages are construction simplicity and ease of mounting/demounting. Positioning a valve between two (rigid) tubes with a common centerline, or parallel/offset centerlines, is more difficult than using an angle valve and tubes at 90°. Although well able to withstand 15 psi overpressure on either side of the flapper, the valve is often mounted with the flapper o-ring facing the normally evacuated space. A popular version of this valve is known as the block valve because it is manufactured from a block of aluminum. These valves share most features and applications noted for angle valves. The difference is one port is turned 90° so its axis is parallel with the other port's axis. This means the valve's conductance is reduced by the additional right angle flow path. In-line metal sealed versions are not available. 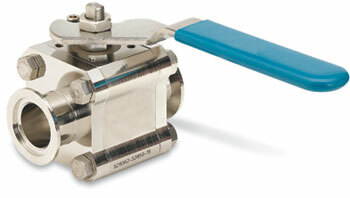 Ball valves are popular in many gas and water applications but less frequently found in vacuum applications. They do, however, provide low-cost, rugged performance at rough vacuum pressures and are found in foreline and trap applications. The ball (flapper) is held in two PTFE rings that surround the connecting ports and seal the valve body to the ball. In the open position, a through-hole in the ball aligns with the ports. Given the limited vacuum applications, this valve's overall conductance is reasonable and rarely an issue. The ball's actuator, usually a handle rotating a shaft, is sealed by a dynamic o-ring. An interesting mounting issue arises with ball valves that have, in addition to the through-hole, a "side-hole" at 90° through one half the ball. With the valve closed, the side-hole connects the valve's through-hole to one port. The intent is to mount it with the side-hole connected to the port closest to the pump. That enables gas trapped in the through-hole to be pumped before the valve is opened to the system. Butterfly valves are available in a range of sizes—large enough to isolate diffusion pumps and small enough for many foreline applications. A popular application is as a down-stream conductance controller to maintain a constant chamber pressure in processes requiring gas flow. The butterfly's flapper is a circular disk with an o-ring around its circumference. The flapper rotates (about its diameter) in the cone-shaped bore. The geometry of the actuating shaft's attachment to the flapper forces the latter into the cone as the valve closes with the o-ring sealing against the valve body. 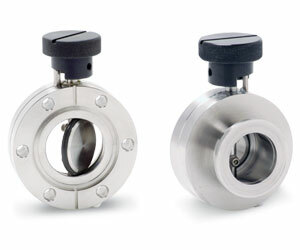 When open, a butterfly valve has a high conductance, with the bore only partially obstructed by the "edge-on" flapper. 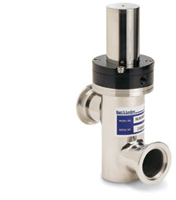 A major application for this valve is down-stream conductance control. Two types are used, the first with the o-ring (as described above) and the second without an o-ring. Without an o-ring, the valve has a known, fixed, minimum conductance when fully closed. With an o-ring, the valve has zero conductance when fully closed. Which is the better choice depends on the application details. 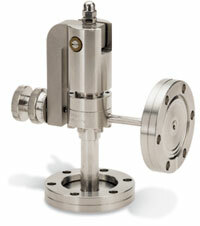 The actuator's rotating shaft is sealed with a (dynamic) o-ring, making the valve unsuitable for UHV applications. One feature of large-diameter valves can surprise users and must be kept in mind when designing a system. Typical large bore valves are sufficiently thin with the valve open; the flapper appears above and below the flange surfaces. That is, the vacuum components adjacent to the valve must have enough free volume to enable this to happen. Conductance controllers are used in sputter or etch applications where the working pressure is roughly 10-2 torr, but the initial check or post-process cleanup pressure is 10-6 torr to 10-8 torr. Most HV pumps cannot tolerate continuous inlet pressures approaching 10-2 torr. But even if they could, a direct connection between chamber and pump would cause an unacceptably high process gas usage. Conductance controllers are ideally suited for applications involving low conductance during processing and high conductance during cleanup. The conductance controller does not, usually, shut off gas flow. Leak valves have two specific applications: (a) to admit gas into a vacuum chamber at a controlled leak rate; and less frequently (b) to backfill a vacuum chamber to low pressure. Even when fully open, a leak valve's low conductance means it should not be mounted between a pump and vacuum volume. A few of the more common mechanisms for controlling gas flow are noted here. Needle Valves: A tapered stem fits into a conical sleeve. Moving the stem (needle) in/out changes the valve's conductance and the gas flow rate through it. The needle's shaft is typically sealed by a dynamic o-ring or PTFE block. Vacuum Leak Valves (commonly called leak valves): At least two sealing mechanisms are used: (a) a soft nickel pad closing against a hard stellite knife-edge ring surrounding the valve's exit port; (b) a hard, optically-flat polished sapphire pad closing against a soft copper ring surrounding the exit port. Both use flex metal bellows to seal the actuator shaft. 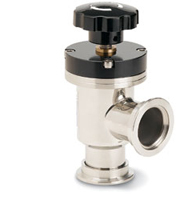 In general, the appropriate leak valve for an application depends on the range of mass flow rate needed, precision with which the flow rate must be maintained, and (occasionally) the upstream pressure. Needle valves find many uses in vacuum processes where moderate to high flow rates (say, 1 to 1,000 sccm) from high pressure sources (1 to 10 bar) are required. Under these conditions, however, some part of the constriction within the valve is in viscous or transitional regime. As noted in the Background, as the room temperature changes, so will the gas flow. Additional disadvantages when using needle valves for high vacuum operation are (a) when closed to their limit, needle valves do not shut-off the gas flow. A common "solution"—over-tightening—often results in needle jamming; (b) bakeout temperatures are limited by o-ring or PTFE shaft seals (usually <200° C). As a result, for applications demanding precise control in the flow range noted above, constant flow despite room temperature changes, and gas shut-off capability—mass flow controllers are frequently chosen. Vacuum leak valves can accept high inlet pressures (~10 bar) yet control extremely low flow rates (say, 1x10-9 to 0.1 T.L/sec). At these flow rates, the significant "throttling" action of the valve is in molecular flow. Once the flow rate is established, it is not significantly affected by room temperature changes. Of particular importance in high vacuum and UHV applications: (a) when closed, these valves shut off gas flow and; (b) since the actuator is sealed by a metal bellows, these valves can be baked to ~450° C making them UHV compatible.